Here is something geeky and not for the fainthearted. If you’re like me, you’ve not listened to Microsoft with the advise not to install Windows 10 Technical Preview on your production Machine. You believe every tech problem is there to be resolved. So you installed Win10TP on your production desktop/laptop and you forgot you’ve enabled an unsupported feature called DeDuplication on your Client machine because you have a lot of Hyper-V VHDx files consuming your precious SSD drive. Now with Win10TP install you can’t access any of your DeDup volumes anymore. It is a dance you have to do with each OS install to activate DeDup on your client since new OS install breaks the former DeDup objects. He not only has extracted the DeDup bits for us into a zipped file, he has also provided the PowerShell script to Re-Enable if you’ve done it before, or to install if you’re activating DeDup for the first time. Download the bits from his OneDrive share and run the PowerShell script found in the included “Install.txt.txt” file. 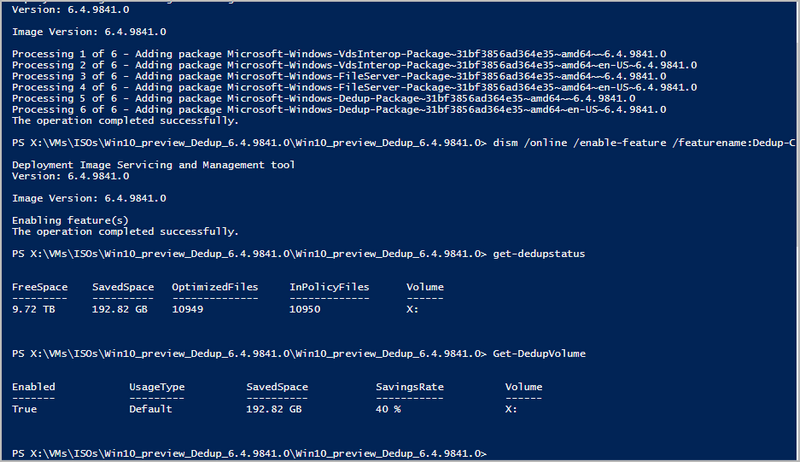 Make sure CD to the folder where you packed out the zipped bits in PowerShell console before running the commands. After running the commands, your old DeDuped volumes are available again and all maintenance schedules are reactivated. You can check with Get-DedupVolume and Get-DedupStatus commands as above. Don’t forget to drop him a word of thanks for his effort, and if you have any question, post in the comments below. [Update:]If you love DeDup on your WinOS Client, please join us in the clamor to get Microsoft to support DeDup on Windows Client so that we don’t have to do this DeDup dance each time we upgrade our client OS. Do you know how to make this work for the newly updated build? Build 9860 was released this week and dedup no longer works. Because the OS code is still the same version of 6.4, DeDup should work again, only you’ll need to reactivate. Rerun the activation script as for 9841, make sure you’re using the extracted Server vNext bits. Get-DedupVolume : The remote procedure call failed. That was also my discovery. Glad you could get to your files. Unfortunately, for the moment it’s not possible to upgrade the Windows Server 10 to build 9860 as the PC Settings app is not working on build 9841 :) And we are stuck… Actually, the option I can think of is to attach this disk to a PC with WS2012R2 with dedup enabled and disable deduplication or just get the files. Still, what did you do in order to access your files? No Panic at all, we can confirn 9841 DeDup drives work also under 9860. You just need to re-enable dedup. Note that some commands will fail, like the typical get-dedup etc, but the dedup service is active and working underneath, and you volumes are accessible again. Let us know how it goes. Feature name Dedup-Core is unknown. A Windows feature name was not recognized. As a result, I cannot open anything on this volume. Also, as already mentioned, PS dedup-related cmdlets and optimization/garbage collection scheduled tasks are not working. McAkins, how did you re-enable it? You’re right that we’ve lost visibility to the state of things on 9860, I indeed think we have schrodinger status now for dedup 9860. When my desktop is less busy I could hear my external disk active indicating possible optimization run. I guess we wont know till we have updated dedup pack. I’m already happy I can access my files for now. Lets keep each other appraised of the situation. Ufortunately not, not till there’s is an update to WinServer next where we can extract the latest DeDup bits.